NorthEndWaterfront.com reports that state Rep. Aaron Michlewitz wants to keep the narrow streets of "the inner North End" scooter free. The City Council last month approved regulations proposed by Mayor Walsh to set up a system to let companies begin renting scooters in the city. Mayor Walsh has filed a proposed ordinance that would let scooter companies begin lining city sidewalks with their for-hire two wheelers - as long as register with the city and promise to get their users not to block sidewalk ramps, crosswalks, fire hydrants and building entrances. Read more. 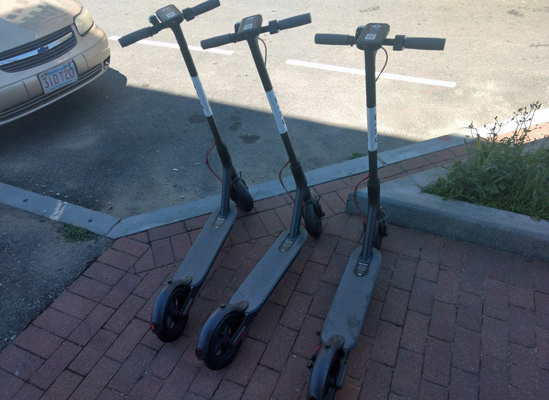 Roving UHub photographer Gary Chase spotted these two Bird rental scooters in the North End on Saturday. Riders are supposed to stay out of Boston, at least for now. 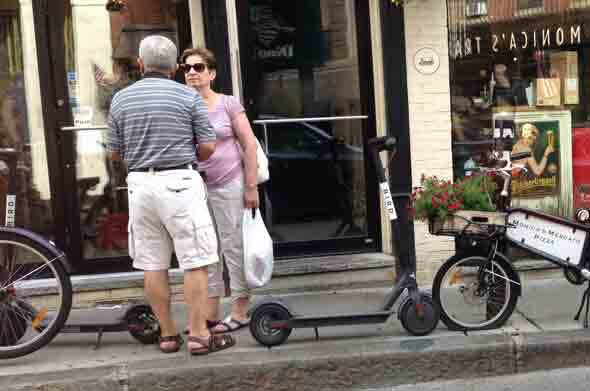 Meanwhile, Cambridge told the company to get its scooters out of that city, at least until officials can come up with some regulations, the Boston Business Journal reports. 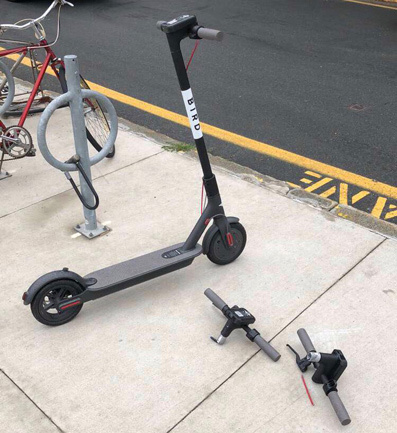 Stephen M. reports this grim scene on DeWolfe Street at Memorial Drive this morning: Somebody's disassembled a couple of those rental scooters that suddenly showed up in Cambridge and Somerville last week - and left behind evidence of their work. John Christian spotted these electric scooters for rent at Assembly Row in Somerville today - after being banned, at least temporarily, in San Francisco. Read more. Paul was kind of amazed to see how somebody park a scooter at the South Bay mall today. Boston Police report on the arrest of a man whose sister may not be entrusting him with the care of her son for awhile. Read more. Mayor Walsh wants to crack down on misbehaving scooter and ATV drivers, who he says have created "a notorious atmosphere of criminal and other disturbing activity so elevated as to endanger the common good and general welfare of the city." Read more. So how does he signal a turn? Boston Police report a 52-year-old man riding a scooter on Blue Hill Avenue at McLellan Street died after a collision with a Ford Explorer around 9:20 p.m., Tuesday. Friday afternoon at about 6:15 PM, just past the intersection with Warren St on the outbound side of Commonwealth Ave, a woman driving a green Volvo station wagon struck and nearly ran over a 49cc scooter driver...me. So, I had my magistrate hearing for my scooter problem from back in September. I posted the details and result of today's hearing in response to the original post, but I wasn't sure how many people would see it using the "Most recent posts" as opposed to the story list and I know that many were interested to hear how it all turned out.